The Silent Ruins and Empty Rooms of Atsion ~ The History Girl! A once-thriving community, today Atsion in Shamong Township is nothing more than a speck on any New Jersey map, if it even happens to be listed. The abandoned village of Atsion tells the story of numerous early American beginnings, failures, and the eventual return to nature for this resource-rich section of the New Jersey Pine Barrens. While the industries have come and gone, many stories remain to be told in the silent ruins and empty rooms of the remaining buildings of Atsion. A Wharton-era barn at Atsion. Only a few years after his investment, Read suffered financial losses in 1770 and advertised his shares of Atsion. Finding prospective buyers was a slow process, as the French and Indian War had strained the economy of the colonies and the impending war with Britain limited investments. Finally, on March 16, 1773, he sold his shares to Henry Drinker and Abel James. Odgen then sold his interest to Saltar and a new company was formed. The first bog iron furnace at Atsion was built by Saltar and Drinker in 1774, separating themselves from reliance on Batsto. By that point Atsion was comprised of a forge, furnace, three sawmills, and a grist mill. The empty rooms of Atsion. During the Revolutionary War, the ironworks became involved in supplying camp kettles to the Continental forces. Because Drinker was a Quaker and pacifist, no ammunition for the war was produced at the Atsion forge. The ironworks remained successful until 1815 and by 1823 was in dire financial failure. In 1824, Samuel Richards purchased the property, beginning its most successful period. Samuel Richard’s father, William, had been successful at Batsto in building an “iron dynasty.” Samuel was a skilled and practical ironmaster. He was born to wealth and twice married into wealthy families. Under Samuel Richards’ ownership, he quickly restored the property, making the forge successful once again. Under Richards’ helm at Atsion he constructed a mansion, company store, church, and numerous workers dwellings. Richards employed about 120 men. During this period, the forge produced fittings and equipment for Philadelphia’a water works and made the castings used in the bridge crossing the Delaware River in Trenton. Richards built the Atsion mansion for himself and his family as a summer retreat in 1826. The mansion, comprised of Jersey sandstone, featured fourteen rooms, each with its own fireplace. Cooking and food preparation was performed in the raised cellar, in an eight foot wide open hearth. The cellar included meat and milk rooms, which kept these provisions cold. A wide porch encompassed the south and west sides of the home. The columns were made of cast iron water pipes, likely produced at Richards' Weymouth Furnace, which had contracts for such pipes with the City of Philadelphia’s water works. Above all of the downspouts is the year 1826, proclaiming the date of the mansion’s construction. Another iron feature were the window sills. A center hall was constructed to run the entire length of the home, with a carriage entrance on the north side. The first floor was comprised of double-parlors, a dining room, and a small kitchen. A rather narrow and unimpressive staircase to the second floor was situated between the kitchen and dining room. The second and third floors contained bedrooms. Richards built a company store in 1827. Store account ledgers show that in 1827 coffee cost 16 cents per pound, eggs 11 cents per dozen, and sugar 10 cents per pound. The store operated until 1946. During its lifetime, it served as a post office and gathering place for the community of Atsion. Atsion Store - circa 1925. 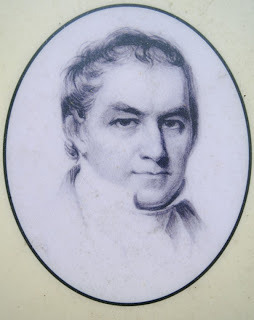 Richards died in 1842, coinciding with the beginnings of a decline of the iron business. Atsion’s new owners tried to revive the area. A paper mill was erected as early as 1852 by Richard’s son-in-law, William Fleming. The original building was two stories and sixty foot long by fifty foot wide. By 1854, the paper mill had become a complete financial loss. On July 11, 1862, the Richard’s estate was sold to Col. William C. Patterson of Philadelphia. In an attempt to reinvent the property, Patterson changed the name of the village to Fruitland and offered plots of land for sale as farms to the public. A few lots in the woods were sold, but this venture was short-lived. The railroad through Atsion to Camden was completed in 1862, in hopes of attracting buyers, but that did not prove to be successful. Patterson declared bankruptcy in 1872. On May 10, 1871, Maurice Raleigh purchased the property, enlarged the defunct paper mill and converted it to a cotton mill. This time, the mill was successful and at its height produced 500 pounds of yarn a week and employed 170 workers. The mill closed in 1882 after Raleigh’s death. Remains of the circa 1853 mill at Atsion. In 1892, Joseph Wharton purchased Atsion. Wharton had purchased thousands of acres in the Pinelands and brokered a deal to supply fresh water from the Pinelands to the City of Philadelphia, which was having problem supply fresh water to its citizens. Once the New Jersey Legislature caught wind of this, a law was passed prohibiting the sale of New Jersey water outside of its borders, which remains on the books today. Wharton also had agricultural interests and he converted the old mill into a cranberry sorting and packing plant. Wharton passed away in 1909. The old mill remained this way until the 1940s. The Wharton estate was sold to the State of New Jersey in 1954 to be preserved as parkland for future generations. In 1977, arsonists burnt the old cotton mill to the ground. Over the years, numerous homes and outbuildings have fallen peril to vandals and neglect. Today the church that Richards built, a schoolhouse, the mansion, company store, remains of a Wharton-era poured concrete barn, and one home dating to the “iron era” are all that remain of a once-thriving community. Ruins of other buildings and forges can still be seen, slowly becoming overtaken by nature. In 2011, Atsion Mansion underwent a $1.3 million restoration. The mansion was restored to how it may have originally appeared during Samuel Richard’s ownership. Conservators peeled back layers of paint and matched the original colors in all rooms. The mansion was never electrified nor was plumbing installed, making this grand structure appear more authentic. Today, the rooms may be empty and its walls bare, yet the sounds of elegant parties in the double parlor and visions of the busy ironworks from the front windows can be easily imagined. The mansion stands as a testament of the Richards era, a time when the Pines were a thriving and prosperous location for early entrepreneurs. Have been looking for the old cemetery in this area. Not the one at the church but one that seems to be overgrown in the woods. I believe its called the old Catholic cemetery but not sure. Anybody know where its located ? I believe there is a small fenced cemetery, only about 4 graves or so, inside the Atsion Recreation area. I think I remember seeing it 20 year ago when I used to take my kids there. I bet one of the Rangers would know.